Fourth-year UA College of Medicine – Phoenix students Christian Dameff (left) and Jeff Tully (right) demonstrate the Google Glass device. Two fourth-year students at the University of Arizona College of Medicine – Phoenix received one of an estimated 6,000 Google Glass units that were distributed earlier this year. Jeff Tully and Christian Dameff were awarded the new high-tech glasses after entering a contest they found via social media. "Google Glass is a wearable computer in the shape of eyeglasses," Dameff explained. 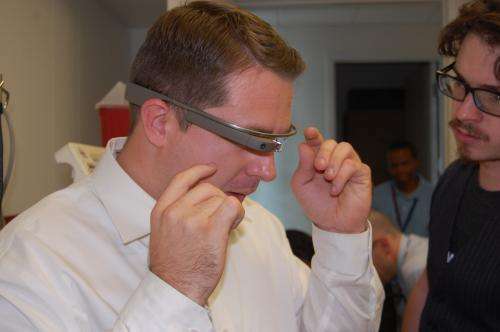 The glasses allow the wearer to "see" a computer screen – they can Tweet, check Facebook and access the Internet all from the mobility of the eyewear. "Here at the College of Medicine – Phoenix, we see huge potential for using Google Glass in medical education," Dameff said. The pair first heard about the opportunity to win the Glass when Google sponsored a contest on its Twitter page in January, asking contestants to submit a short summary of their intended use for the technology. 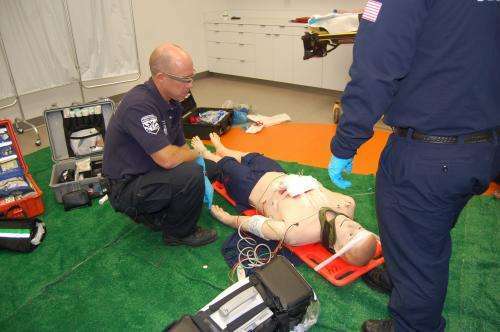 Dameff and Tully had come up with the idea to use Glass in assisting with advanced cardiac life support, or ACLS, a set of intervention steps one takes when presented with cardiac arrest or another life-threatening medical emergency. "We thought Glass would be very helpful for assisting someone in remembering those steps," Tully said. Tully and Dameff drew up a scenario of what a simulation lab would look like through Google Glass. The company liked it and so the pair flew out to San Francisco to learn about the device. Phoenix firefighter Mike Thomas uses the Google Glasses during a simulated scenario at the UA College of Medicine – Phoenix. Phoenix NBC news affiliate Channel 12 visited the UA to film a segment showcasing the Glass – which involved City of Phoenix firefighters and "Jim" the high fidelity mannequin. The first responders were assisting Jim after he fell from a ladder and was impaled in the chest by a pair of scissors. One of the first responders wore the Glass and communicated with Dameff and Tully, who posed as doctors at the local emergency room. The responders were able to give a detailed report to Dameff and Tully, who then gave directions to further assist the patient. The simulation exercise represented what Dameff and Tully hope the Google Glass can accomplish in real-world medicine: enhance pre-hospital patient care. "Receiving important information on the fly can help us save lives," Dameff said. "When you can live-stream an image from the scene, it gives physicians so much more information. They can make the appropriate decision to help save the patient's life." Dameff emphasized that the biggest barrier to using this type of technology was the infrastructure to implement it, but now with Google Glass and Wi-Fi connectivity, the potentially life-saving technology can be used in emergency vehicles. "Every clinician – doctor, paramedic, nurse – that has had the opportunity to use Google Glass has been excited about the technology," he said. "New ideas pop up every time we show these to people. This type of inspirational technology really allows people to think outside of the box." Tully, who is originally from Los Angeles, and Dameff, a Tucson native, said they believe they are the only medical students who have the privilege of working with the Glass on their own. "I know there are some students working with the assistance of a physician," Dameff said. "But we are the only autonomous medical students who get to use Glass." "It's pretty exciting to be one of the few that we know of applying Glass in both medicine and education," he said. "Google Glass can apply to a whole host of emergencies where every second counts."